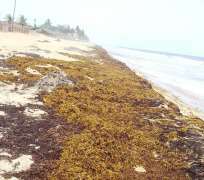 ABIDJAN 20 Nov 2015 – Regional seaweed experts ended a three-day meeting in Freetown, Sierra Leone, with an 11-point set of recommendations of dealing with the Sargassum seaweed that is being washed ashore in several countries of West Africa. The meeting accepted all the recommendations. Uppermost among them is that the worst affected countries to form and implement national action plans to manage the seaweed influx. The worst affected West African countries are Benin, Côte d’Ivoire, Ghana, Guinea, Liberia, Nigeria, Senegal, Sierra Leone, and Togo. They have asked the Abidjan Convention Secretariat for help in dealing with the phenomenon. Experts at the meeting suggested that demonstration projects be set up in these countries; that the private sector be drawn into transforming the seaweed into economically viable products; and that a special protocol of the Abidjan Convention on the Sargassum be formed for ratification by Convention member states. Additionally, the experts urge that money is sought nationally and globally to support regional programmes on the Sargassum. They are also calling countries to ensure that the dangers and opportunities the Sargassum pose and offer are discussed at the next United Nations Environment Assembly. The experts proposed that regional research be undertaken to identify the factors driving the presence of seaweed in the region. They called for an annual expert group meeting on the seaweed to build on regional knowledge and encourage the adaption of best practices in dealing with the weed. One of the best management practices accepted at the meeting was the creation of “Green Brigades”, or the contracting a company, to manage the seaweed. In this endeavour, they would have to use mechanized tools. The establishment of seaweed farms with storage capacity in affected communities was another best practice accepted. Partner organizations of this meeting are the Sierra Leonean Environment Protection Agency , USAID’s West Africa Biodiversity and Climate Change project and the Global Programme of Action for the Protection of the Marine Environment from Land-based Activities , the only global intergovernmental mechanism directly addressing the connectivity between terrestrial, freshwater, coastal and marine ecosystems. The Swedish International Development Cooperation Development Agency, SIDA, funded this meeting. Protection, Management and Development of the Marine and Coastal Environment of the Atlantic Coast of the West, Central and Southern Africa Region. The Convention applies to the 22 coastal countries from Mauritania to the Western shores of South Africa. The Convention’s Conference of Parties is its foremost decision-making body.